Comedian and entertainer Howie Mandel uses fist taps instead of hand shakes as a coping strategy for his mysophobia. Years before this became a popular greeting method, I was using fist taps to connect with my G343 Psychology students. Early in the course, we would use our hands as models when learning about human brain anatomy. The hemispheres and lobes of the brain were represented by both hands and the position of the fingers and knuckles. To promote our psychology learning club, or learning community, we would touch fists when entering or exiting the classroom, and to acknowledge each other when outside the classroom. This gesture became a symbol of connection for a few hundred psychology students. This year, I am using a similar theme to promote connected learning at our school. During our summer institute day, I introduced my fist, specifically the four knuckles, as symbols for improving learning at our school. Knuckle of index finger - put learning first. 9 out of 10 people report enjoying learning, yet fewer than 50% of students surveyed enjoy school. Schools no longer hold a monopoly on education, but they can still be the epicenter of learning by making personalized, connected learning a priority. Educators who embrace the role of lead learner, or co-learner, help to establish a collaborative, results-oriented tone in the classroom. Knuckle of the second finger - become connected. Educators readily acknowledge that relationships matter. Web-based technologies are accelerating and personalizing learning through ubiquitous access to information and to other learners. Educators making contributions to PLNs, and PLCs are reinvigorating their learning, and modeling enjoyment of connected learning for their students. 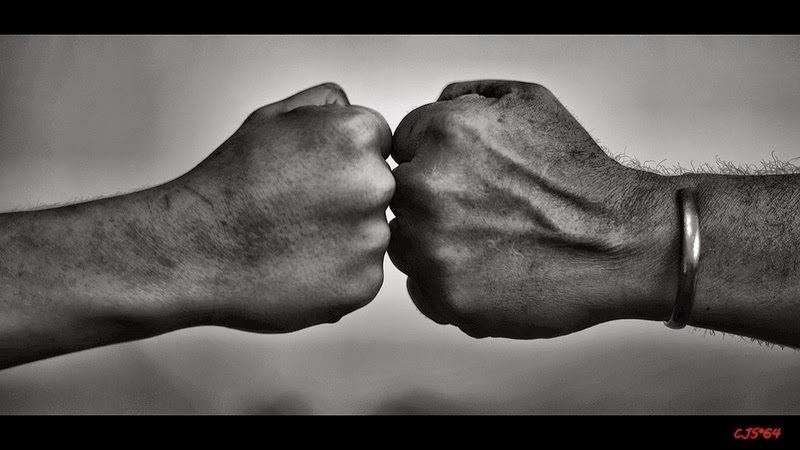 Knuckle of the third finger - share your story. Scrapbooks, journals, and file cabinets held a certain degree of significance in the analog world, but where's our personal record in the digitized world of today? Digital portfolios and blogs are tools that educators can use to reflect upon and communicate their learning stories. Knuckle of the little finger - get a little better each day. Everyone wants to improve, but few of us formulate plans, or goals, for doing so. Adopting a growth mindset and constructing a plan for incremental self improvement fosters intrinsic motivation, increases general satisfaction, and contributes to both personal and organizational growth. It is my hope that the practice of fist-tapping will grow at our school. Not just a greeting, fist tapping could also serve as a reminder to learn, connect, share, and improve. In addition to being a gesture for promoting community spirit, I hope that it will also become a symbol of our commitment to building a culture of connected learning. Pound it!